It was the early 1990s, before Starbucks became a household name. Jeff Taylor and Fred Polzin were roommates in Topeka, plotting their next steps in the world. But Jeff just couldn't function without a good cup of coffee, so he started brewing an idea with Fred—why not open their own coffee shop, and bring a higher-quality coffee to Topeka. "(Fred) knew how to manage fast food. It's the same thing," Jeff said. "He didn't even drink coffee." Percolating a Plan PT's Coffee—P for Polzin, T for Taylor—was born with the opening of their first coffee shop in 1993. The Barrington Village location soon became a hot spot, so they opened a second store in 1994 at Fleming Place. Their partnership combines Jeff's ideas and Fred's business sense. "He's always looking at the highlight, and I help make sure it gets done," Fred said with a laugh. Jeff said they were feeling pretty good about their success until one day he struck up a chat with a man in Lawrence who'd been to their shop. The man said it was a nice place, but the coffee was terrible. "In my mind, I always wanted to do it because I wanted to have good coffee (and) someone called me out on the quality of the coffee," Jeff said. "I started thinking what's going to make the coffee better or worse. What we figured out is it's freshness. We were getting coffee, and it's already stale. So I called Fred and said, 'We gotta get into roasting.'" "And I said, 'What?!'" Fred chimed in. Jeff spent the next two years learning everything he could about roasting, documenting every roast on a spreadsheet, tasting and tweaking. Finally, he tested it side by side with the prior product. To his disappointment, it really wasn't that different. He said that's when it hit him. Freshness isn't the only key. "You only get out of something what you put into it," Jeff said. "If you start with a flawed ingredient, you'll get a flawed product." Growing a New Approach PT's launched its roasting operation in 1997 and almost immediately began planting the seeds for what was a unique approach in the coffee industry. As Jeff explains it, at the time, coffee was sold on a commodities market. The $0.49 a pound that farmers received was less than half of the $1.20 per pound it cost them to produce it. "The coffee industry was in crisis," Jeff said. "They were walking off their farms because they couldn't make enough to support their families." The result was the development of fair trade. It offered farmers $.06 a pound above their production cost. Jeff said while it saved the coffee industry, farmers still had no incentive to produce a better quality product. 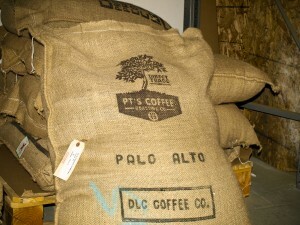 A coffee competition in 1999, called Cup of Excellence, transformed PT’s direct trade approach. Jeff said farmers entered their best coffee beans, and the winners were auctioned online. PT's paid $11 a pound for the winning beans from Guatemala. "We realized we had the opportunity to meet the best farmers, and now the farmer has incentive to produce a better product if he has the chance to get a better price," Jeff said. Because he's working directly with the farmers, Jeff said he is able to see firsthand how those from whom he buys are using their income to ensure continued quality. "We offered them a livable wage. It works," Jeff says of the direct trade approach. "We're changing society; changing the world in that regard." Topeka Flavor Which brings us back to Topeka and the PT's roasting operation, tucked among a row of warehouses at the Forbes Field Industrial Park. This is where a fresh, high-quality ingredient gets a dash of technology to capture that flavor Jeff knew coffee could achieve. "We want to develop the bean to develop what the flavors are,” Jeff said of the roasting process. “We're looking for development that allows the nuance of the coffee to come through." Their warehouse has three roasters of various sizes. A computer system tracks roast profiles and weather stations monitor both indoors and outdoors, since factors like humidity can impact roasting. Don't expect to see piles of product sitting on shelves. As they've maintained from the beginning, freshness matters. Beans leave the roaster to be bagged and almost immediately sent on their way to customers. This approach has earned PT’s Roaster of the Year honors from Roast Magazine, and consistently high scores from industry reviewers. Ensuring customers receive the highest quality product falls largely to Jeff’s wife, Maritza Taylor, a Colombia native and respected expert in the coffee industry. As PT's Director of Quality, she checks each roast and sets up cuppings, including blind taste tests, to evaluate the coffees for flavor and consistency from batch to batch. "The roasters, the baggers, all cup coffee, so they know how it's supposed to taste," Fred said. "We want layers of flavor." Taste of Success Dedication to quality has given PT's a taste of success. They've grown from roasting about 5,000 pounds of coffee a year to 40,000 pounds a year, serving customers in 24 states. Fred and Jeff believe PT's is positioned well for the next transition in the coffee industry. With farmers producing a better product and roasting processes evolved, they say the focus has turned to how it ultimately gets to a customer's cup. "It's more like wine now," Jeff said. "We're identifying brewing processes that accent that coffee. We're trying to tell the story of that farm, where the coffee came from, and it's our job to accentuate the flavor that's there naturally." Which means a return to their retail roots. PT's sold its original two shops years ago (Barrington Village is now Cara's Cup, while Fleming Place is the current Blackbird Bistro), but got back into the game with PT's at College Hill and, more recently, at the Crossroads in Kansas City, Missouri. They plan to develop more retail stores, with a focus less on the big brew pots and more on options like pour over bars and cold brews. "We're focusing less on syrups and 20 ounce drinks and focusing more on the quality of the product, so you can taste the sweetness that's in the product by itself," Jeff said. No matter where future growth takes them, both Jeff and Fred expect to keep PT's firmly rooted in Topeka. Fred, the analytical mind, cites good people, good workers and low overhead, along with a central location that's a plus for shipping a fresh product. Jeff, more of a dreamer, cites a more sentimental reason. "This is where we started, and this is home," he said.